Ancient Greek OCR is easiest to use on Linux with the free software OCRFeeder application, which is packaged by most major Linux distributions, along with Tesseract and the Ancient Greek training for it, also commonly packaged. If it isn't packaged for your distribution, search the package repository and you will very likely find an OCR program that uses Tesseract under the hood, as there are quite a few to choose from. 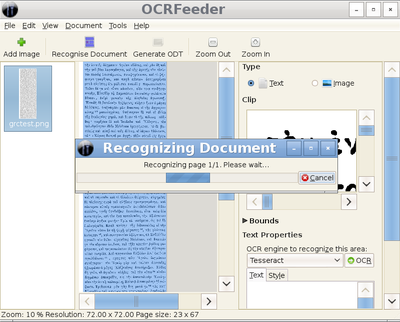 To install it on Debian or Ubuntu just install the packages ocrfeeder and tesseract-ocr-grc. On other distributions the packages should be named similarly. Not all distributions will have the Ancient Greek Tesseract training, or will only have an older version. You can download the newest one from the Download section of the main webpage, and either place it in /usr/share/tesseract-ocr/tessdata/, or inside a directory called 'tessdata' anywhere else and set the environment variable TESSDATA_PREFIX= /path/to/parent/directory.